Photo: Robert I. Morse House, ca. 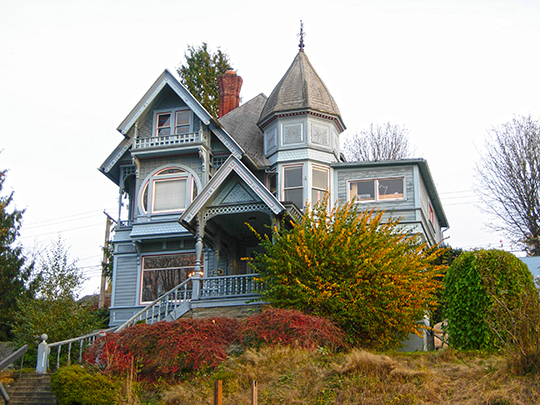 1896, 1014 North Garden Street, Bellingham, WA. Listed on the National Register of Historic Places in 1977. Photographed by User:Benjamin Cody (own work), 2007, [cc-by-3.0 (creativecommons.org/licenses/by/3.0)], via Wikimedia Commons, accessed March, 2016. Whatcom County Courthouse is located at 311 Grand Avenue, Bellingham WA 98225; phone: 360-676-6700. Created in 1854, Whatcom is one of a handful of Washington's nearly 40 counties that adopted its own constitution following the 1978 adoption of its Home Rule Charter. Whatcom County lies in the northwest corner of both the State of Washington and the coterminous United States. It is bounded on the north by the Canadian border, on the east by Okanogan County, on the south by Skagit County, and on the west by the Strait of Georgia and Bellingham Bay. These borders enclose large parts of the Mount Baker National Forest and the North Cascades National Park, which take up about two-thirds of Whatcom County's total area. All but a few residents live in the western third of the county. Bellingham, with an estimated 2002 population of 69,260, is Whatcom County's largest city. Other cities include Blaine, Everson, Ferndale, Lynden, Nooksack, and Sumas, and there are several smaller unincorporated communities. Two Indian reservations and associated trust lands are located within Whatcom County's borders. The Lummi Nation reservation is on the Lummi Peninsula and Portage Island on the western side of the county; the Nooksack Tribe reservation and trust lands comprise several parcels along the Nooksack River in the west-central area of the county.